Interesting and important new paper: Microbial composition of purified watersÂ – microBEnet: the microbiology of the Built Environment network. The limits of water treatment to control microbial regrowth were examined using highly purified waters. Measurable microbial genetic material was detected in the product water in a survey of thirteen laboratory pure water systems. Illumina 16S rRNA gene amplicon sequencing revealed surprisingly diverse microbial assemblages, confirmed to be active in bioassays, with no direct relationship to quality or maintenance of the systems. With storage under both light and dark conditions, a 2-log increase in bacterial genetic markers was observed within 10 days, indicating viable oligotrophic communities despite rigorous treatment steps. With growth, microbial communities shifted concurrent with enrichment of Proteobacteria groups capable of nitrogen fixation (Bradyrhizobium) and H2 oxidation (Comamonadaceae). This study has implications not only for laboratory studies, which rely on highly purified waters, but also for municipal drinking water, which depends on treatment to reduce nutirents sufficiently to limit downstream regrowth of microorganisms. Water Impact Statement Highly purified waters are depended upon for a variety of laboratory, industrial, and other applications. The same general principle of disinfection alongside removal of nutrients, such as organic carbon and nitrogen, to prevent downstream regrowth is applied in municipal water systems to protect public health. 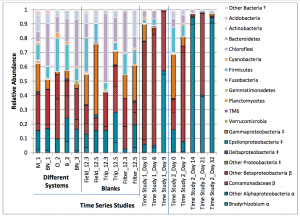 Here we survey the microbial assemblage composition of thirteen laboratory-grade water purification systems and identify which microbes are associated with regrowth. We observed a wide diversity of DNA sequences, with a 2-log increase in total bacterial gene markers in less than 10 days. This study highlights the practical limits of nutrient limitation as a means of microbial control and indicates that additional measures are also needed to deliver high quality drinking water, especially when pathogen re-growth is a concern. The paper is not open access but you can get it for free by registering (see the link to the paper above). It is definitely worth a look for those interested in water and the microbial content of water. Based on my reading of the paper by Proctor, Edwards and Pruden, two broad questions are being approached: (1) what happens to microbial levels when waters are transferred to sample bottles from flowing systems, whether rivers, lakes, or Built-Environment (BE) process streams, and (2) if waters are exposed to the atmosphere, particularly low-nutrient waters, what can happen in terms of substrate levels? Whipple G.C. (1901). Changes that take place in the bacterial contents of waters during transportation. . Tech. Quart., 14, 21-29. ZoBELL C.E. (1937). The influence of solid surface upon the physiological activities of bacteria in sea water. A14. . In: J. Bact., AGRICULTURAL AND INDUSTRIAL BACTERIOLOGY. Thirty-eighth Annual Meeting of the Society of American Bacteriologists. Indianapolis, Ind., December 28th to December 30th, 1936 p. 86. J. Bacteriol. , 46, 39-56. Geller A. (1983). 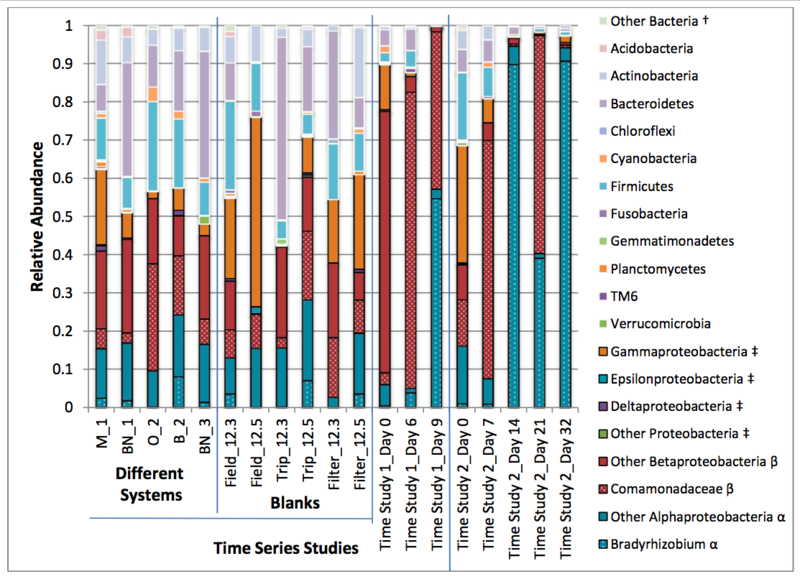 Growth of Bacteria in Inorganic Medium at Different Levels of Airborne Organic Substances. Applied and Environmental Microbiology, 46, 1258-1262.
of approaching these questions and evaluating the paper by Proctor, Edwards and Pruden . The above-cited publications, in my view, are particularly important. Comments would be appreciated. Hello Jonathan, I’m one of the curious cat here. I never realized about this study. While reading it. I feed myself on the knowledge on your post. Thanks sir.